Utah Onions fears plan would ruin area food production. 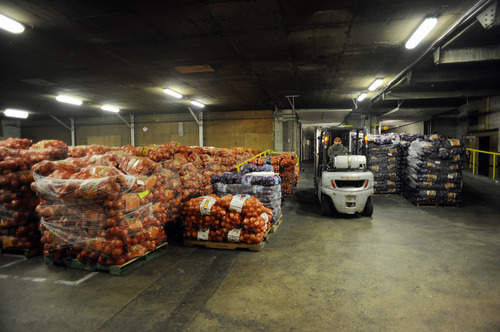 Sarah A. Miller | The Salt Lake Tribune Onions wait to be shipped out at Utah Onion in Syracuse Tuesday April 19, 2011. If the proposed West Davis Corridor plan is approved they would lose onion growing lands. 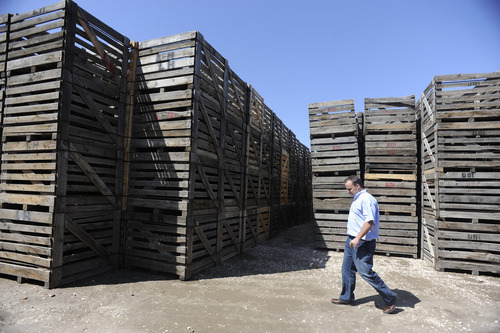 Sarah A. Miller | The Salt Lake Tribune Shawn Hartley, one of three owners of Utah Onion, walks past crates used to store onions at his Syracuse business. If the proposed West Davis Corridor plan is approved their growers would lose onion fields so Utah Onion would not have the need for such large storage room. 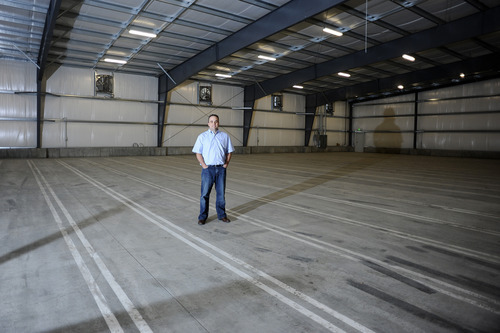 Sarah A. Miller | The Salt Lake Tribune Shawn Hartley, one of three owners of Utah Onion stands in a large storage room build last summer for winter onion storage at his Syracuse business. If the proposed West Davis Corridor plan is approved their suppliers would lose onion fields so Utah Onion would not have the need for such large storage room. 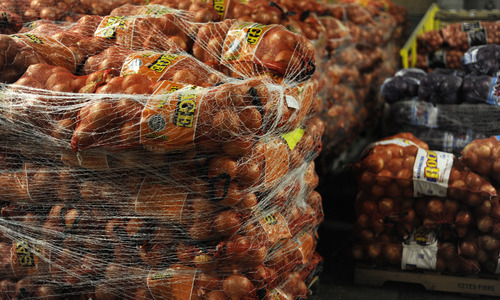 Sarah A. Miller | The Salt Lake Tribune Onions wait to be shipped out at Utah Onion in Syracuse Tuesday April 19, 2011. If the proposed West Davis Corridor plan is approved their growers would lose onion farming lands. Syracuse • Fresh out of college, Brad Dahl plowed into onion harvesting in 1978. At that time, farmland stretched in west Davis County as far as his eyes could see. Today, Utah Onions Inc. is surrounded by houses, schools and commerce  and Dahl fears that a proposed superhighway could be the downfall of the few remaining agricultural ventures still producing food in western Weber and Davis counties. 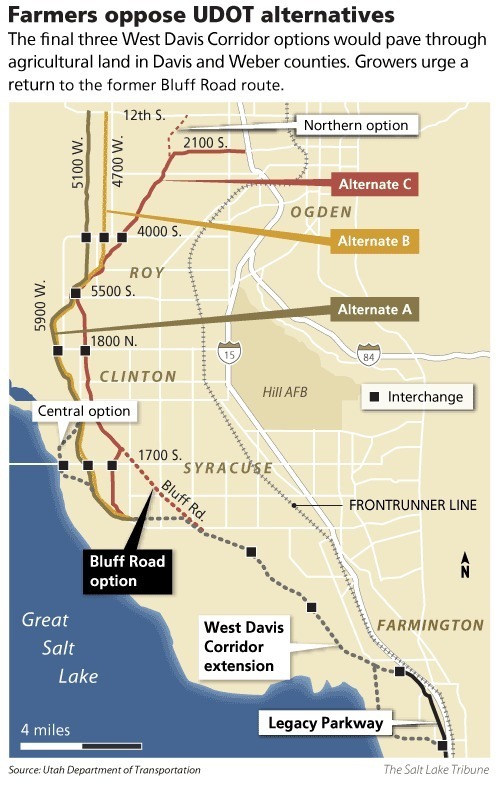 For several months, the Utah Department of Transportation has been gathering input from residents who could be impacted by the 25-mile West Davis Corridor, which would stretch from the Legacy Parkway at Farmington north to either 2100 South or 1200 South in Ogden. "We've built a reputation for growing a high-yield, single-center onion," the best kind for making onion rings, Dahl said. "Something about the climate and soil here." Utah Onions ships several varieties of the bulbous vegetables to every mainland state and also to Mexico, Canada and Puerto Rico. The spicy-sweet onion smell wafted through the company's warehouse Tuesday as Dahl, flanked by co-owners Shawn and Trent Hartley, spoke with reporters about their concerns. Utah Onions was part of a tour organized by state Agriculture Commissioner Leonard Blackham, who also showcased Davis County's Black Island Farms, Hamblin Dairy and Bay View Duck Club  all at risk if bisected by the future roadway. "You're messing with field drains when you put a highway down the middle," said Dahl, who fears the project could ultimately strip the land of its economic viability. Utah Onions contracts with 11 growers in Davis and Weber Counties who farm 550 acres. Each acre yields 50,000 to 75,000 pounds of onions, Dahl said. Leland Hogan, president of the Utah Farm Bureau Federation, spoke against UDOT's final three route alternatives. "This micro-climate is very important to agricultural production in Utah," Hogan said, "and to break it up in any way would not only disturb the ability of these farmers to make a living but it would also disturb the wetlands [bordering the Great Salt Lake]." Under Utah law, land set aside in an agricultural protection area can only be taken for road construction if no other alternative exists. Blackham questioned why UDOT discarded the Bluff Road alternative that runs farther east. "For decades, cities, counties and even UDOT have taken steps to make Bluff Road the corridor for future transportation needs," Blackham said. UDOT Project Manager Randall Jefferies said Tuesday's tour was informative and helpful. "We'll take the information and look at how we can adjust to minimize impacts," Jefferies said. The Bluff Road option  which UDOT favored in 2001  got sidelined due to a growing number of adjacent homes, community facilities and wetland concerns. "We'll look at maybe reinstating that option, or an alternative very close to that corridor," Jefferies said. The agency's environmental-impact study will conclude in 2013. So far, no funding has been identified for the $500 million corridor, Jefferies said. Of Utah's 54.3 million acres, only 11.4 million, or 21 percent, are privately owned. A total of 1.3 million acres are designated as prime farmland, if irrigated. Davis and Weber Counties have an abundance of "prime" soil well-suited to growing crops. Area farms generate more than $73 million for the state's economy and also provide hundreds of jobs. The proposed Legacy expansion project would bisect much of the farmland in Davis and Weber counties.